This past Saturday, I took a watercolor class. I know that doesn’t sound edgy or exciting, and you certainly wouldn’t automatically think, “Danger, Will Robinson!” stepping into class, but I had butterflies. What if I sucked? It was last year about this time I accepted a challenge to join the Art Guild and participate in a Studio Tour. The tour was set for October. What would I have for people to look at or possibly purchase if they came out to see the studio my mom, daughter, and I shared? I learned how to make some simple jewelry. It was a hit! I still experiment with that, make pieces when I’m trying to relax, and play with color and composition a lot. But I really wanted to see what else I might be able to do. When a class was offered in town with a well-respected artist, I said, why not? Then went on a shopping spree. Who knew you needed so much “stuff” to paint? The class was an all-day workshop. Every level of experience welcome. I’ve never painted in my entire life, so I was the bottom of the rung. I chose a simple shape. 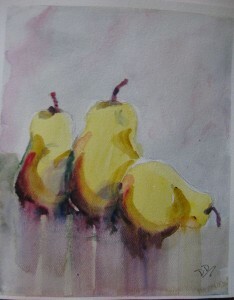 I wanted to paint a single pear. The instruction told me to add two more. Said I’d done a good contour drawing. He probably said it to build me up, but hey, I glowed! I don’t think my pears are half-bad. I’m getting them framed. And I’ve signed up to take an oil painting class. So what have you done lately that took you out of your comfort zone?